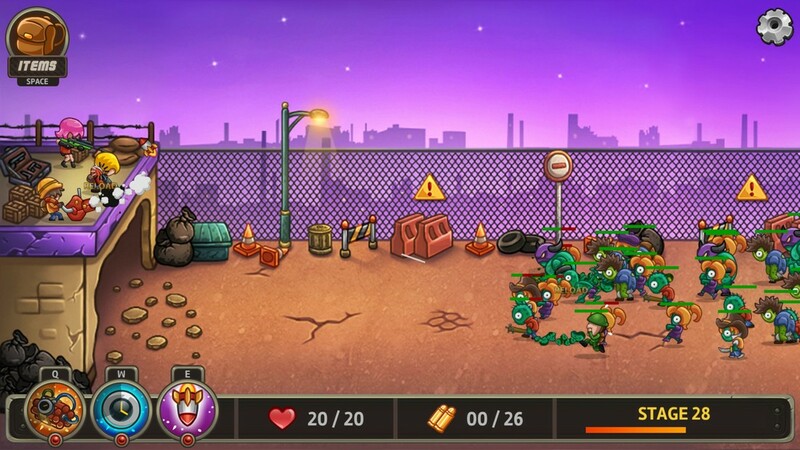 Zombo Buster Rising is a simple 2D tower defense game with some minor RPG elements. The story is that something bad happened and there are zombies everywhere. Your player character is trying to hold out until reinforcements arrive. That pretty much sums up the story. Nothing too exciting, but then again it is a tower defense game. 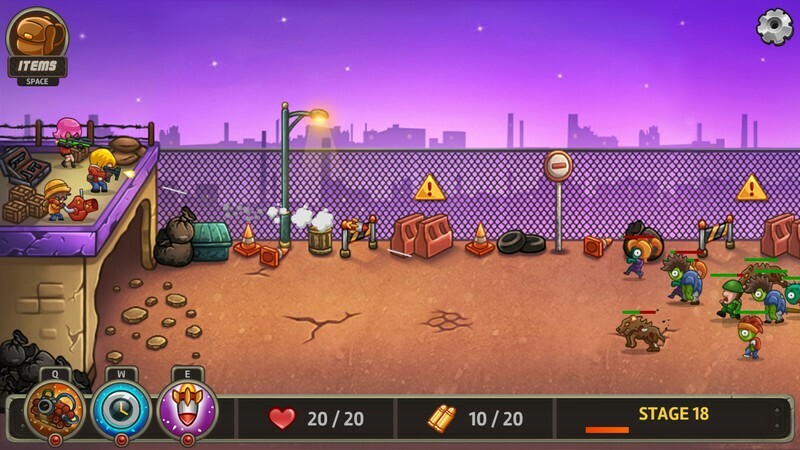 The game consists of thirty stages and each stage has you fending off tougher waves of zombies from reaching your base. Occasionally you will have survivors running towards your base with the zombies and if they make it to the base you get small sum of gold. There are a decent variety of zombies from your basic slow walkers to ones that can fly. Each stage only takes about three minutes to complete. Killing zombies sometimes gives you gold and at the end of the stage you get a one to three diamond rating depending how much damage your building took. Besides the player controlled character you unlock a sniper and a rocket shooting character that are computer controlled. These characters overall do a good job of attacking incoming zombies and I never really saw them do anything crazy. 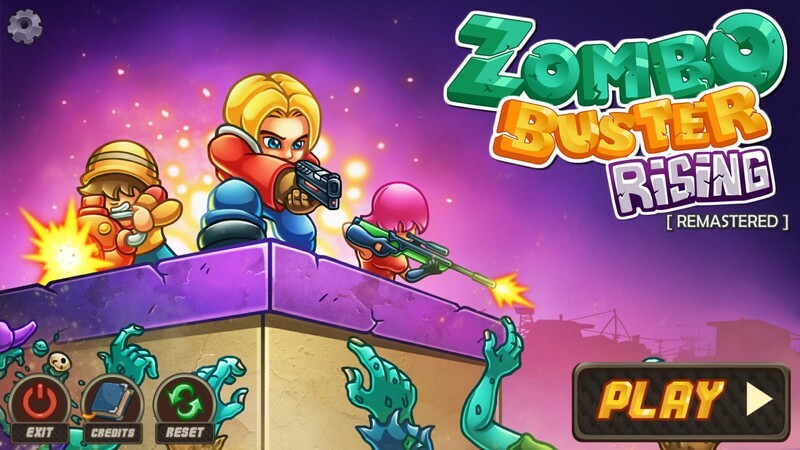 All three of the characters can have there weapon damage, rate of fire, reload speed, ammo capacity and special power upgraded using money earned killing zombies during stages. Besides the two NPC characters, you also have three abilities that you unlock to help you out. One is an explosive that can be placed anywhere, one freezes time and the last one is an airstrike. 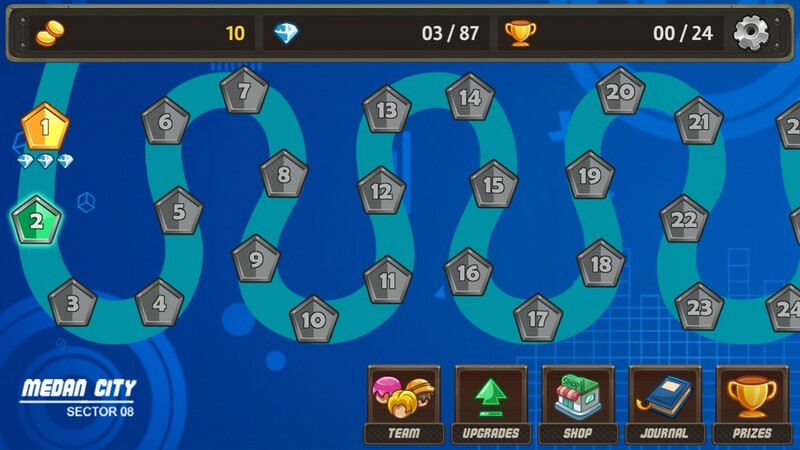 All of these are on timers and can be upgraded using diamonds you earn in between stages. There are also upgrades that use diamonds that involve doing more critical damage, earning more money and having survivors run faster and last longer. There are also base items that can be purchased with gold in between missions. 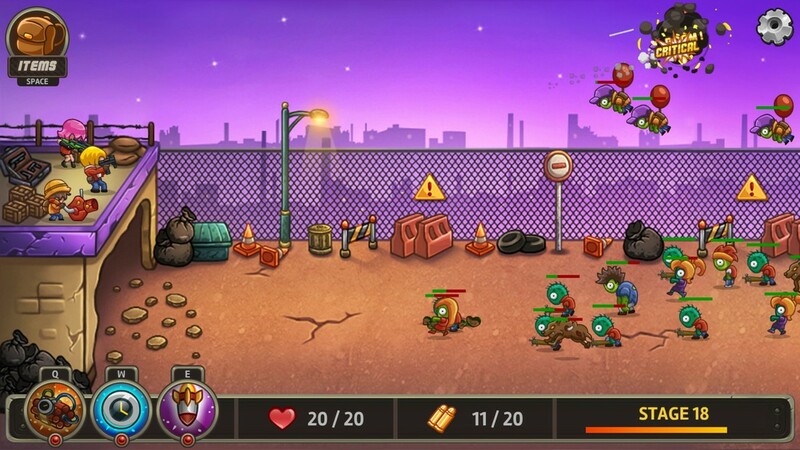 One lets you regain five base health, one resets all ability cooldowns and the last one kills all ground zombies. Unlike abilities, these do not have a cooldown to use them since you can buy multiple copies of them to use. To be honest I never used these items until the final boss battle. And even then I only used the one that killed all the ground enemies. I enjoyed the graphic style of the game. 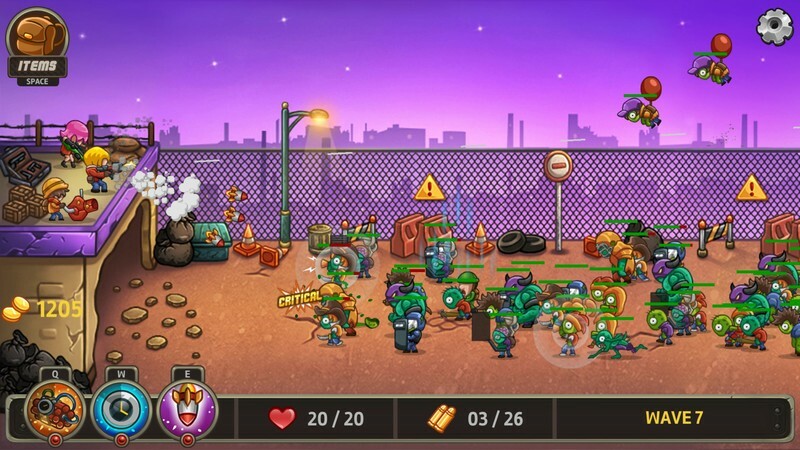 The game uses nice, bright sprite graphics for all the player and enemy units. The stage background looks good too, although you see the same background constantly with little to no changes throughout the game. The audio in the game was decent, I had no problems with the music and sound effects. With that said the audio was not memorable either. This game does not have many flaws but the ones it does could bother you depending on what you are looking for. First off the game is not hard if you spend a little time grinding out money. Out of the game’s thirty stages, the only time I lost was the first time I did the final boss and even then I almost won that fight. Also, after you beat the game which took me under three hours, there is really nothing to do. You do unlock an endless wave stage but there is no reason to do this unless you really enjoyed the game. In other words, once you beat the game there is no real reason to come back to it. I had fun with this game. Although short, everything it does it does well. However, for most people this is going to be a game that you play, beat and probably never go back to.